Is Hitchcock a superficial, though brilliant, entertainer or a moralist? Do his films celebrate the ideal of romantic love or subvert it? 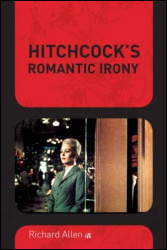 In a new interpretation of the director's work, Richard Allen argues that Hitchcock orchestrates the narrative and stylistic idioms of popular cinema to at once celebrate and subvert the ideal of romance and to forge a distinctive world view - the amoral outlook of the romantic ironist or aesthete. He describes in detail how Hitchcock's characteristic tone is achieved through a titillating combination of suspense and black humor that subverts the moral framework of the romantic thriller, and a meticulous approach to visual style that articulates the lure of human perversity even as the ideal of romance is being deliriously affirmed.Discussing more than thirty films from the director's English and American periods, Allen explores the filmmaker's adoption of the idioms of late romanticism, his orchestration of narrative point of view and suspense, and his distinctive visual strategies of aestheticism and expressionism and surrealism. Richard Allen's book is a remarkable work of synthesis, drawing on a wide range of Hitchcock scholarship that now spans half a century. But it is more than synthesis: Allen has his own original take on the elements that combine to create what he calls Hitchcock's 'unique cinematic intelligence.' Arguing that the full richness of a classic like Rear Window can only be fully grasped if the film is 'understood in the context of the entire pattern of Hitchcock's work,' Allen sets himself to tease out that entire pattern, making illuminating links between films of different periods, genres, and styles. Above all, his analysis of the films' elaborate visual aesthetic serves as a means to get to the heart of what they convey about the intricacies of human sexuality. An exhilarating read.